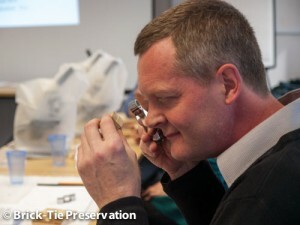 A great day of learning at the Property Care HQ – as usual! 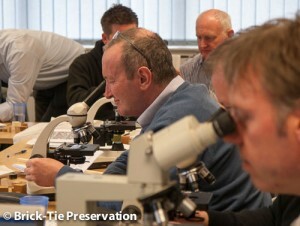 The PCA have a great suite of courses in timber infestation and damp diagnosis. Dry Rot, wet rots and all woodworm species are covered. This year the program has been strengthened with a course dedicated to the visual identification of timber species in buildings. Most of us can hazard a guess as to what ‘sort’ of timber we are looking at, but sometimes the species is crucial, such as Lyctus infestation, which can only infest large pored hardwoods – no good if you don’t know how to check pore size, or even what a hardwood looks like, compared to softwood. I have studied this subject before on a two day course in High Wycombe, but that was years ago, so I jumped at the chance to get down to Huntingdon, with my business development manager Sean Tristram-Jones along too. 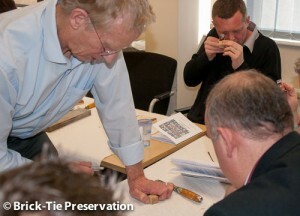 Timber industry expert Gervais Sawyer was on hand and had prepared a great day for the delegates, with hands on practical sessions for us to work through. The effort Gervais had put in beforehand was clear, with each of us receiving a bespoke A5 booklet with 38 pages of useful facts to help us. He also supplied a CD with even more resources so we could spend time back home refining our skills. The aim of the course was to help us identify the most common timbers used in construction, using a variety of methods, and to develop the necessary practical skills. Session 2 – Approaches to identifying wood; History, colour, smell and shipping marks; The tools available; chisel, microtome, razor blades; Preparation of samples, use of a hand lens, identifying common hardwoods by key features. 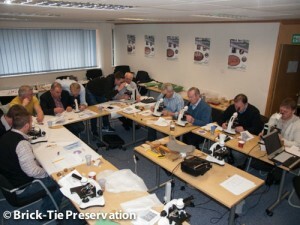 Session 3 – Cutting thin sections; use of the microscope from low to high power; improving contrast via staining. Session 4 – Features of hardwood and softwoods; A 3-D view with the scanning electron microscope. It’s amazing what you can tell with just a small X10 hand lens, once you know what to look for and how to section the timber correctly to expose the end grain (Transverse section), radial plane (Radial longitudinal section), and the flat face (Tangential Longitudinal section). Once these are cleanly cut the features of hardwood are clear to see (most of the time), and by cross checking the size and distribution of vessels, growth rings and other features, the species can be reasonably judged. We’ve all heard the terms ring porous and diffuse porous, but these are so useful for narrowing down the species and making a good diagnosis. 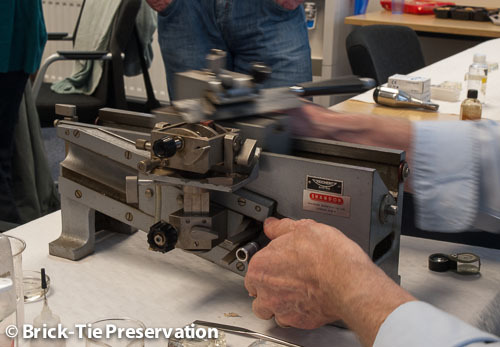 On the other hand, softwood structure is really microscopic, so we got to play with the microtome and various chisels and blades (I cut my thumb immediately). 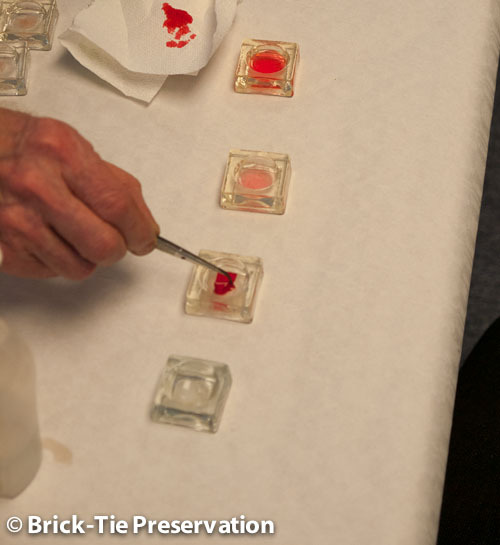 Once the slivers of timber are cut, they need staining because otherwise the cells are almost transparent. It was funny in class because once we had our samples and got them under the microscope there were plenty of gasps as the wonderful and intricate structures were brought to life. The tracheid’s, rays, with parenchyma cells and resin canals were clear to see. I was really enthralled by the sight and look forward to checking some more from surveys in Yorkshire in my day job as a damp and timber surveyor. For the softwoods Gervais supplied us with a basic decision tree to work through and by a process of elimination, arrive at the correct species. 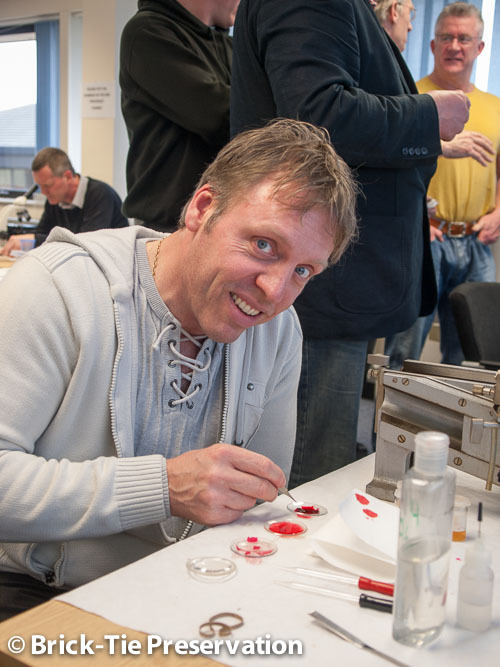 The PCA have invested in a suite of microscopes, including one with live CCTV so that a slide can be inspected by the whole class for learning purposes – great stuff. So that is what timber really looks like…. It’s clear that most of the common hardwoods we come across in our our daily work can be identified on-site without anything more than a sharp chisel and a X10 hand lens. For softwoods though, a small sample needs to be boiled in water until all the air is expunged. Then the sample is sectioned into the three required sections, whilst still damp, so that air bubbles don’t form. Then it’s a staining and mounting job, to keep the air out whilst it’s inspected. It takes a little time but is well worth the effort and I will be incorporating this into my timber surveys where appropriate. The class was fully booked and everyone seemed to have a good day. It was good to meet up with like-minded PCA members; taking time out to improve their knowledge and improve their service to clients. A big thank you to Steve Hodgson and Gervais Sawyer for a great day of very valuable learning. Gervais also mentioned a distance-learning course, which I’ve decided to enroll on straight away, and I’ll blog something on that for anyone who wants to know more. The PCA are planning another day later in the year so do contact them for further information. In addition to the learning on offer it was great to see Ross Charters of Complete Preservation, Les and Jacki from Shaw Preservation, Dean Webster from South East Timber and Damp and Terry Read of TW Read damp proofing. Anyone wanting to read up on these things should try “Trees; Their Natural History” by Peter Thomas, a smashing book and well work getting. PS – need timber surveys in Yorkshire by timber surveyors who keep up-to-date and know their stuff? Try my timber and damp consultancy service. Always the keen members who attend – see you at the next! Very please you enjoyed it – We are always looking for new things to do and opportunities that develop member skills and help put them ahead of the game. Gervais has a knack for making this subject fun and exciting, even at his own family dinner table. I am currently home learning from a CD given to me by Gervais about timber identification. This reflects the sort of exceptionally high quality training and attention to technical capabilities I have come to associate with the PCA. It would be interesting to know how to identify the quality of a certain timber for construction.